Mobile inspection forms / mobile audit checklists will save you time, reduce errors, allow to collect diverse data types with one device and ensure that everyone involved has real time access to the inspection results. All types of inspections: property inspections, equipment inspections, asset audits, safety and compliance inspection, construction sites inspections, oil and gas pipes inspection, etc., etc. - have very similar workflow. You need to fill out inspection form or checklist in the field, deliver collected data to the central repository, access completed inspection forms and create reports. Use of the smartphone or tablet and mobile forms makes field inspections fast, efficient, and accurate. Centralized cloud storage ensures that all authorized employees have real time access to the critical information. Regardless of what type of inspections / audits you are doing you can create inspection form(s) that fit your business needs and workflow. Update forms at any time as needed. Create as many inspection forms and audit checklists as you need via a web dashboard. Use your current paper / PDF forms or start from scratch. If you have different inspection / audit forms for the different asset groups, you can indicate for which asset group(s) each form is valid. Divide large forms into the sections for clarity and easier form completion. Optionally include clarifying text and / or images for the form fields, so that an inspector knows exactly what he needs to fill out in each case. Include any number of image field(s), that will allow an inspector to take photo(s) with a smartphone and include photos as part of the inspection. Include repeatable sections for the line items if you do not know beforehand how many items will be needed. An inspector will be able to dynamically add / delete repeatable sections and fill them out as needed. Optionally pre-fill part of the form and push it to the mobile devices for completion in the field. Optionally create and upload an MS Word template for the PDF reports that will be created for the inspections that are based on this form. Define what should be included in the report, it's look and layout. Use reports internally and / or e-mail to the customers. Make sure that data collection process is efficient and accurate, and collected data are delivered to a centralized storage location instantly. 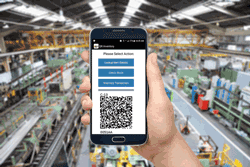 A field inspector starts with scanning QR code or barcode on an asset, equipment or property to uniquely identify it and get a list of the applicable inspection mobile forms or checklists. An inspector can complete inspection form that was pushed on the mobile devices by an administrator, finish a form that was started before, or start a new form. As an employee fills out an inspection form, the data are automatically saved on the smartphone or tablet - (s)he can start, stop and resume at any time. QR Mobile Data mobile application verifies that all required fields are filled out, and that entry is correct for the field data type. For image type form fields an employee takes a photo using a smartphone. Submitted images can be viewed as part of the inspection report. 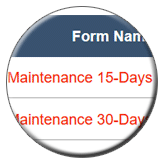 An inspector can dynamically add sections to the form. For example if several problems are discovers, (s)he can dynamically add a section for each problem, that main contain problem selection, description and an image. Scan items for the checklist instead of finding them on the form and checking off. QR Mobile Data mobile application will find the scanned item and check it off automatically. If required, an employee can collect authorization signature at the end of the inspection. When inspection is completed, it is submitted to a centralized cloud location and is available to all authorized users in real time. 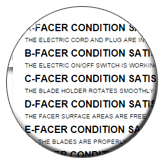 Optionally an inspector can create an inspection report in PDF format. (S)he can view report, print and / or e-mail to specified addresses from the mobile device. Look and layout of PDF report is defined by you via custom template. The report can contain your branding (logo, address, etc. ), information on the inspected object, inspection details, including captured image(s), and a signature. If connection is not available at the inspection site, completed inspection form is saved on the mobile device. An inspector can submit all completed inspection forms at once when connection becomes available. GPS location of the inspection, inspector name, date and time of the inspection are captured automatically and are transmitted along with the completed inspection form. Create real time information flow in your organization. Make sure that authorized employees can access critical information fast and act on it. Accessing Data In The Field. An employee can access all recently done inspections and audits on a specific asset, equipment or property by scanning QR code or barcode label with a smartphone. Office employees can access inspection and audit data via a web dashboard as soon as inspection form is submitted. 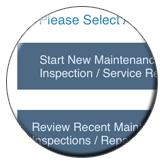 Search submitted inspections by various parameters (dates, location, asset or equipment, inspection type, etc.) to quickly find required record(s). Identify and pull out all records that have specific problems or deficiencies, or did not pass a test. Update inspection, or fill out "office only" part. If an administrator reviewing inspection determines that something is incorrect or missing, (s)he can push inspection form back to the mobile devices for correction / completion. View inspection locations on a map. Print and export inspection reports. Create PDF report of the inspection, optionally e-mail internally, to the customer and / or external auditors.